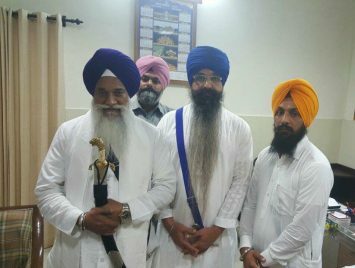 Patiala/ Chandigarh: In a sudden move three SGPC backed Jathedars – Giani Gurbachan Singh, Giani Raghbir Singh and Giani Harpreet Singh met Sikh political prisoner Bhai Balwant Singh Rajoana in Patiala jail. The meeting assumes significance as during his last visit to Rajindra Hospital in Patiala, a few days back, Bhai Balwant Singh Rajoana had come out in support of Shiromani Akali Dal (Badal) on the issue of incidents of beadbi of Guru Granth Sahib at Bargari village in 2015. The Bargari beadbi incident issue has become one of the central issues of present-day politics in Punjab as the Punjab government has announced to table the report of Justice Ranjit Singh Commission in the state assembly during next session of Punjab Vidhan Sabha. The session is set to begin on August 24 and will continue till August 28. Three SGPC backed Jathedars reportedly met Bhai Balwant Singh Rajoana on Monday (Aug. 20) evening. Old Picture of Bhai Balwant Singh Rajoana with Akal Takhat Sahib’s Jathedar Giani Gurbachan Singh Ji. Later speaking to journalists, Giani Gurbachan Singh said that Bhai Balwant Singh Rajoana was dedicated to the Akal Takht Sahib and efforts were being made to get his death sentence commuted. Notably, a delegation of Shiromani Akali Dal (Badal) had met Central home minister Rajnath Singh recently to persuade him to recommend ‘clemency’ for Rajoana. A plea against Rajoana’s death sentence is pending before President of India. The plea was filed by the SGPC in 2012 and decision on it is to be taken by the Central government of India on President of India’s behalf. During his last visit to Rajindra Hospital, Bhai Balwant Singh Rajoana had also criticised the “Referendum 2020” move maintaining that it was an attempt to weaken the Shiromani Akali Dal (Badal). The developments gain significance in wake of the fact that the SAD (Badal) is making every attempt possible to put the credibility of Justice Ranjit Singh Commission’s report under question as this report reportedly exposes the role of this party in granting so-called pardon to Dera Sauda Sirsa chief Gurmeet Ram Rahim (September 2015), mishandling of beadbi incidents (October 2015) and police action against Sikhs in Kotkapura and Behbal Kalan (October 2015).